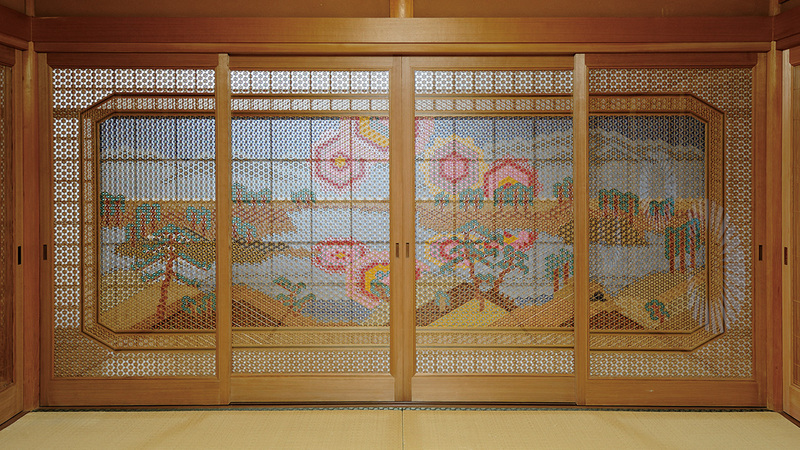 We consider Sashikan’s unique decorated joinery as a kind of art. 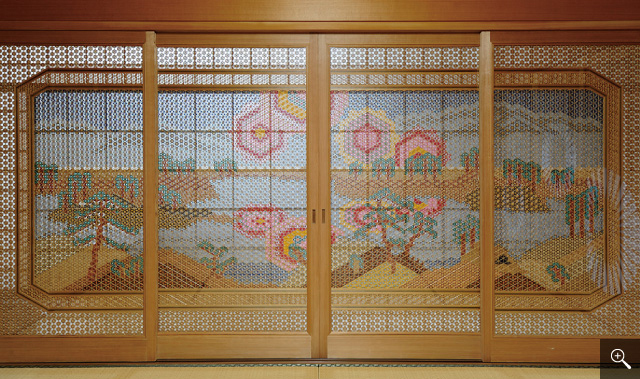 Yukio Kuroda, president of Sashikan, works with traditional natural motif such as flowers, birds, and the moon, and combines them in his original designs with bold composition and gorgeous patterns. With complex techniques in every element, his works are impossible to imitate, and are highly valued. Each product is a one-off piece, created just for you. If you are particular to produce a great atmosphere on your housing or stores, our kumiko is one of the best solution for that. 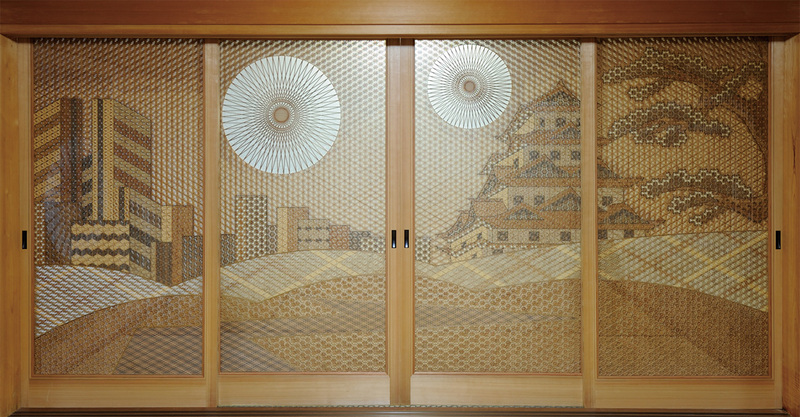 Illustrating the contrasting cityscape of Nagoya castle and the surrounding modern buildings, this piece shows the unique artistic senses of Yukio Kuroda.The high level technique "Roppo-korobi" is used here to bring out shadows and depth. 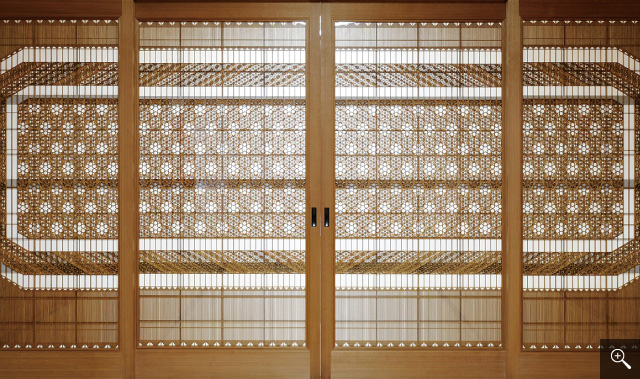 This flower type muntin is achieved by incorporating geometric patterns into lattices with evenly spaced vertical timber bars.An oriental design using the lotus, a reoccurring inspiration in Buddhist art, as its motif.The beautiful flower pattern silhouettes are shown by exterior lighting. 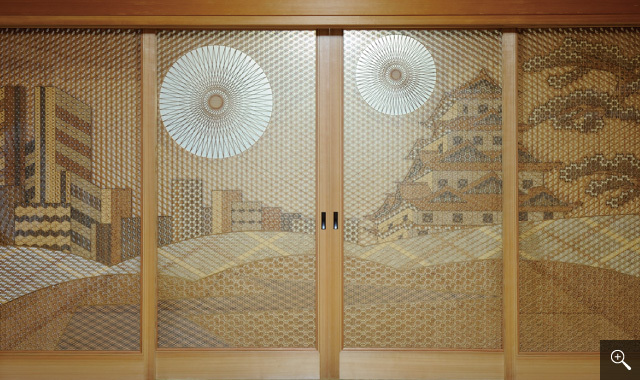 A masterpiece displaying the symbol of Japan, Mt Fuji, in all its glory.Depth is created by combining the wooden pieces in layers while the sun is expressed using our unique Goko-gumi technique. 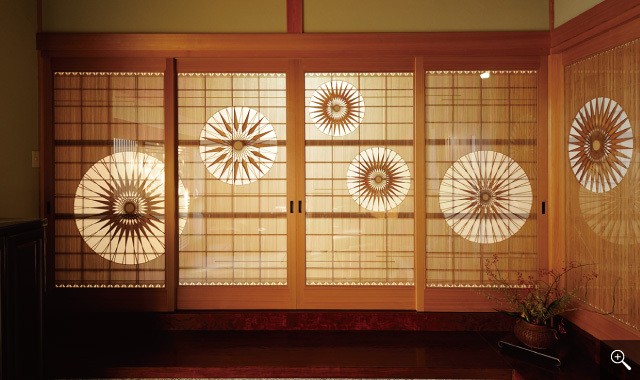 Jindai cedar is used for the shadow parts, allowing for colour contrast. 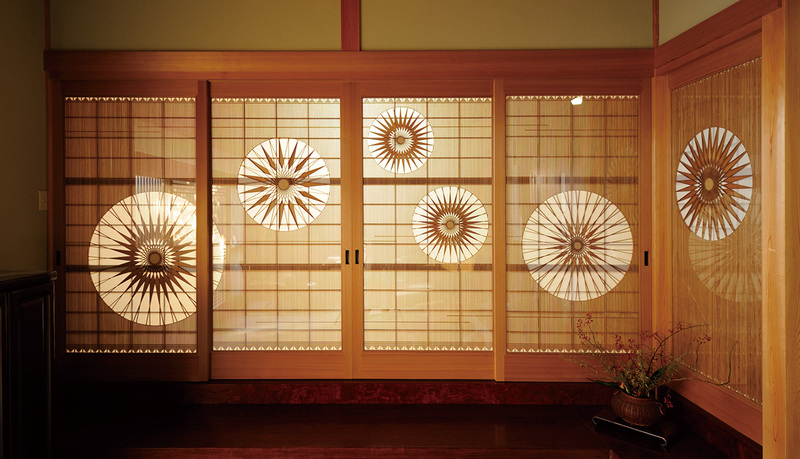 Buddha's aureola is represented using a technique called the "Yaguruma Goko-gumi". The quintessential summer image of Japan : a fireworks show.The vivid colouring is achieved by painting the raw materials.The fireworks and their reflections in the river are delicately depicted.The Ukiyoe style arrangement is impressive, reminding us of the ukiyoe prints of the Edo era. A masterpiece depicting the beauty of Himeji castle, also known as Hakuro-jô; white eagle castle.Over 100 thousand muntins are assembled with masterful precision.the high skill levels are especially apparent around the hemming. Here, wooden rings built using the Goko-gumi technique are linked together by a wooden chain, mimicking the movement of bicycle wheels.This is a rare design and the movement is activated by a sensor.